The Rose Gardening Gloves are specifically designed to help you keep your garden looking beautiful while also protecting your hands. The Rose Gardening Gloves from Bionic allow you to enjoy pruning your roses and working your rose beds without experiencing the sting of thorns. The gloves provide full arm to thumb protection with an extra long gauntlet and thumb cover made of composite Tough-Ex material that keeps the thorns from penetrating. The gloves are constructed with top-grade, supple cabretta leather with added padding in the palms to stand up to constant use. Meanwhile, strategically placed anatomical relief pads even out the surface of the hands to naturally promote a lighter, more secure grip, and to remove the friction that cause blisters and callous build-up. With Motion Zones over the knuckles and Web Zones between the fingers, the gloves support the hands’ natural dexterity while allowing them to breathe and release heat and Coolmax inserts provide further ventilation. Finally, for a second-skin feel and grip-support, the gloves offer a pre-rotated finger design that further supports natural finger movement. The Bionic Rose Gloves allow you to reach into your bushes for pruning without the sting. Anatomical Relief Pad System: The hand has natural peaks and valleys determined by the placement of the bones. Typically the high points of the bone rub against tools and equipment, causing blisters, calluses, and fatigue. Bionic gloves are designed to solve this problem with strategically placed pads in the glove, that eliminate the peaks and valleys–evening the surface of the hand–to result in improved grip strength, reduced hand fatigue, and reduced friction–to virtually eliminate calluses and blisters. Pre-Rotated Finger Design: Because your forefinger and pinky naturally rotate inward toward the center of your hand when grasping an object, Bionic gloves feature a pre-rotated design that follows the natural motion of your fingers, to offer a comfortable, second-skin feel, and natural movement when gripping. The hands combine 14 phalanx bones as well as large number of tendons and muscles to allow for an intricate range of motion and dexterity. Bionic gloves offer Motion Zones over the knuckles, and Web Zones between the fingers, made of stretchable and breathable Lycra to provide greater flexibility, support the hand’s natural dexterity, and keep the hands cool and dry. To find out your glove size, measure (in inches) around your dominant hand (when ordering pairs) with a tape measure at the place indicated on the diagram shown at right. 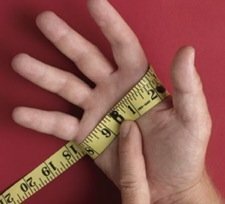 Use the tape measurements below to determine your proper glove size. If you need additional assistance on sizing or fit of the gloves, please contact Bionic at 877-524-6642 or e-mail bionic@slugger.com. Be the first to review “Bionic Women’s Rose Gloves” Click here to cancel reply.